← Day 42: Go to the NFB. Ah, Thrifty Thursday… Where to begin? Firstly, I adjusted my day to ensure I was on-line at 10 am to buy tickets for an upcoming foodie event. Success! Next, I went to hot yoga. So far, so good. Then, I tried to go for a bike ride with a friend of mine, since the weather has been fabulous. I figured my new thing today could be to try some awesome bike tricks that I saw on-line. And that’s where I hit my first snafu, or, more likely, the universe kindly contrived to protect whatever bones I had not already broken. Popping a wheelie! OK, it's not me... so what's your point? To be fair, it’s been a couple of years since I’ve ridden my bike. Mainly because I’ve been in Ireland, but also because I broke my ankle last summer, and even I have my limits. Needless to say, the tires needed a lot of air, and we have a pump. So no big deal, right? Wrong! Back tire little doo-hickey to make the valve usable in a regular pump got stuck and wouldn’t come off, and all efforts to make the pump work with the tiny little valve on the front wheel were thwarted. 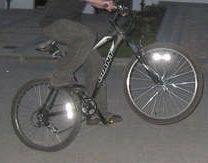 As much as I have considered myself to be an athlete most of my life, I couldn’t quite fathom trying to bike constantly popping a wheelie on my rear tire. So, I opted to borrow the bike belonging to the male in the household, whom is considerably taller than I am. No worries; one minor seat adjustment, and we were on our way. I managed to keep myself upright, despite a few close calls getting my feet out of the cages on the pedals, and enjoyed the tour of the neighbourhood. When the skies started to threaten, we decided to skip the usual post-bike patio bevies (it’s always important to have goals), and I ran a couple of errands instead. By the time I got home, I still had plenty of time to try and execute my alternative plan for today, which was to learn how to properly clean (gut and descale) a fish. So I went to my local fishmonger, who informed me that they pay for their seafood by weight, so they usually buy their fish already cleaned. But it would be no problem to order one in for me some other time in the future, as in, after today… Crappity crap! WTF?!!? Apparently, it’s an exclusive club, and, like Groucho Marx aptly stated, “I don’t want to belong to any club that will accept people like me as a member.” I have two letters for you, Pinterest: U F. They are organized in Yoda-speak at the moment, but I trust you will be able to correctly rearrange them to determine the sentiment I am trying to convey (and yes, I know, for the quote to apply, I am assuming they will eventually accept me as a member… but that doesn’t alleviate my current conundrum). Regardless, I followed the site’s advice to check out some pins. 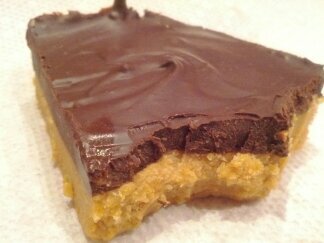 Lo and behold, one of the very first things I see is like a beacon of light: make Reeses peanut butter bars from the Bakerlady! OK, to be fair, that might have been Kim Crawford talking (the bottle of yummy sauvignon blanc from New Zealand we had with dinner). 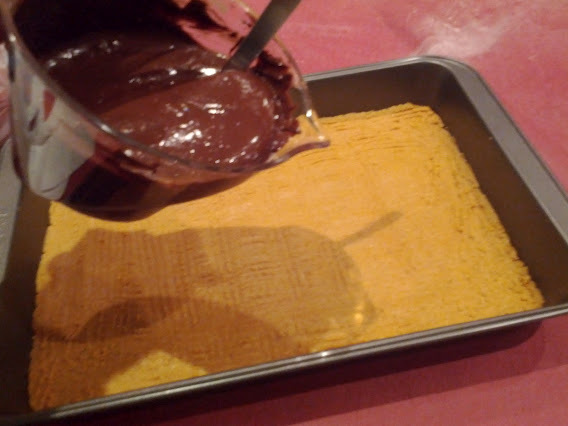 But the chocolate and peanut butter squares did look incredibly tasty and delicious! And I had never made them before… Plus, as a bonus, it would serve as another way to incorporate more protein into my diet. Talk about win-win-wine! (Thank you, auto-correct). Luckily, there is a grocery store about 6 blocks from my house, so it took no time to zig-zag my way over there to pick up the necessary ingredients. 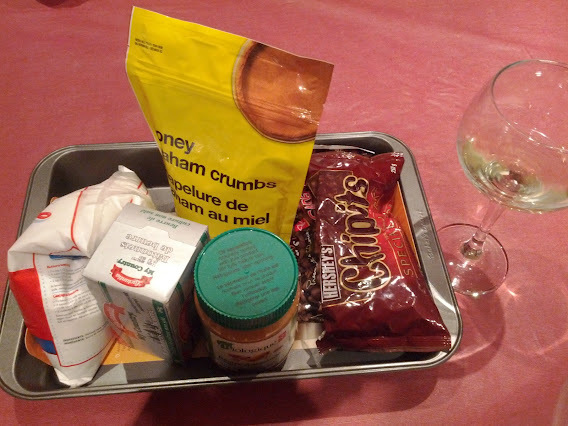 Back in the kitchen, I assembled everything, including the last of the wine, because it’s always important to keep the chef in the right spirit of things. Then, I got down to business. For once, the recipe really was as easy as touted (and certainly much easier than pie – for the life of me, I will never understand that expression!) In no time flat, I had the peanut butter base in the pan, and the chocolaty peanut butter topcoat melted in the microwave. Into the fridge they went, and an hour later, presto! In a word? Yum! To keep the calorie count in check, I offset the square intake with some detox tea, because after all, life is about balance. Oh, and I should probably get those 10 minutes on the ultra vibe before bed, as reinforcement. This entry was posted in Food and Drink and tagged April, bicyle, chocolate, Drink, Food, peanut butter, Pinterest, Reeses, squares. Bookmark the permalink. 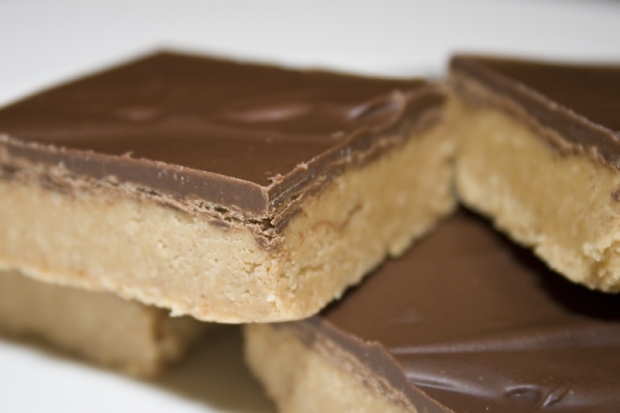 1 Response to Day 43: Make Peanut Butter Bars.